Emoticons have become a part of our everyday life when texting, so Microgaming has decided to bring it to you in an online slot that could change your life forever. EmotiCoins has some fun and quirky animations that will keep you in high spirits throughout your gaming experience. The slot has 30 fixed paylines, 5×3 reels, Wild Stickers™, Wild Blast™, Scatters, Free Spins and a whole lot of winning opportunities. This captivating 30 payline game features some familiar faces and promises fun, fun, fun! When you land 3 or more of the LOL Scatter symbols anywhere on the reels, you will be awarded 10 Free Spins. On your first Free Spin, 1 symbol will turn Wild. Wild Stickers™ will be active during this feature, which will appear on the reels on every second spin. What’s amazing about the Wilds is that they hold until you have 5 Wilds at the end of the feature which will remain in place for the duration of the feature. The bets during the feature will be the same as the initial bet that triggered the feature. When you land Scatter symbols, they will pay in any position, they will only appear in the base game reels, add to payline wins and Scatter wins will multiply by the total bet stacked. Landing the Wild symbol on during the base game will substitute all the symbols except the Scatter symbol and other Wild symbols that land on the reels. 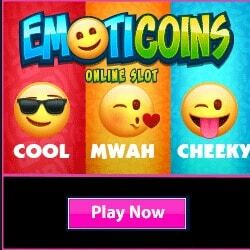 EmotiCoins is an exciting online slot jam-packed with fun and thrilling features. With a friendly minimum bet of 0.30, and exciting wins up to 92 000.00, this game is one slot you’re sure to Like! Wink, wink! Play EmotiCoins at any of the Fortune Lounge casinos (Royal Vegas, Euro Palace, Vegas Palms, 7Sultans, Platinum Play, Red Flush, Casino La Vida, All Slots, All Jackpots and Wild Jack), and you could be laughing, smiling, grinning, kissing or falling in love all the way to the bank with Emoticon wins of up to 460,000 coins.